InnoFoods Organic Coconut Clusters, 18 oz. 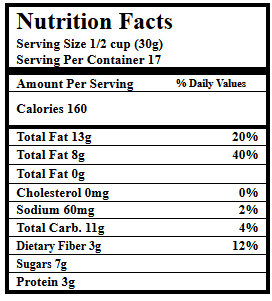 Click the button below to add the InnoFoods Organic Coconut Clusters, 18 oz. to your wish list. InnoFoods Organic Coconut Clusters are made from some of Earth's best stuff. Our coconut clusters are an amazingly delicious, super snack. They're organic and the perfect compliment to salads, yogurt, cereal or just eat them straight out of the bag! Lightly sweetened coconut that's non-GMO, Gluten-free, vegan and contains no preservatives, colors or fake stuff. You're gonna love them! Ingredients: Organic Coconut, Organic Pumpkin Seeds, Organic Sunflower Seeds, Organic Cane Sugar, Organic Brown Rice Syrup, Organic Chia Seeds, Sea Salt. Madhava Organic Coconut Sugar, 16 oz.